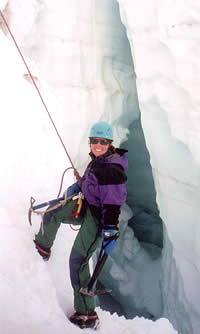 Kit Lasher on Alaska's Kahiltna Glacier in 1998. "Equal justice under the law is not merely a caption on the facade of the Supreme Court building. It is perhaps the most inspiring ideal in our society. It is one of the ends for which our entire legal system exists. It is fundamental that justice should be the same, in substance and availability, without regard to economic status."  Lewis F. Powell, Jr. WHEN LEWIS F. POWELL, JR., became an associate justice of the Supreme Court in 1972, he was known as one of the nation's leading corporate lawyers, a prodigious "rainmaker," and a pillar of the legal establishment. Less well known was his life-long dedication to provision of legal services to the poor. Indeed, as a young man, Powell was so active in the local legal aid society that he earned a reputation as the leading "free" lawyer in Richmond. The Lewis F. Powell, Jr., Fellowship in Legal Services honors Justice Powell by supporting a recent Law School graduate who works with a sponsoring organization to provide legal services to the poor. The fellowship is awarded for one year, with the expectation of renewal for a second. During that time, each Powell Fellow receives a stipend of $35,000, plus the usual benefits for an employee of the sponsoring organization. Proposed projects might address such issues as child abuse, domestic violence, affordable housing, access to health care, and consumer protection. Whatever the area, the Powell Fellow's project must involve the delivery of legal services to persons in need. The Powell Fellowship is a partnership between the Law School and the Powell family. Some donors, such as Edward J. Kelly III '81 and Peter W. Quesada '80, have contributed major support to the Powell Fellowship out of loyalty to the Law School. Others, such as ABC News President David Westin, a University of Michigan Law School graduate who clerked for Powell in 1978-79, and the partners of Hunton & Williams, have given out of loyalty to Powell. Some donors have ties to both. These include Molly Powell Sumner '72 and her husband Christopher J. Sumner '71, Lewis F. Powell III '78, and Norm Scher '62, a former Powell law partner. All together, more than 120 donors have pledged $1.5 million toward the $2.5 million required to endow this worthy project. As the Law School's inaugural Powell Fellow in legal services, Katherine "Kit" Lasher '02 will find herself face-to-face with some tough situations. But if anyone can mobilize the people and forces necessary to make a difference as a child advocate, Kit can. Lasher was chosen as the 2002 Powell Fellow and in September she began working with the Riverdale office of Maryland's Legal Aid Bureau (MDLAB), a group of forty attorneys providing free legal services to Maryland's neediest residents. Because her interests and experiences lie with child advocacy, Lasher was anxious to join the staff of eleven attorneys who represent children in need of assistance (CINA). The group handled an overwhelming 5,500 CINA cases in 2000. "I am very interested in child welfare-related issues," she said. "As a Powell Fellow I will be working in the best interests of children who are neglected or living in abusive environments. It's very nitty-gritty work, but I'm ready to jump straight in." Lasher has already experienced some of the challenging and draining tasks of a child advocate. On the first day of a summer internship in 2000 with the Texas Department of Protective and Regulatory Services, she worked with an attorney whose work included terminating the permanent parental rights of an incarcerated mother. Given the nature of such proceedings, many lawyers serving as child advocates do not stay in their position for a long time. Standing before a judge and advocating for an outcome that goes against the wishes of parent and child can be difficult for all involved. But it is the job of the advocate to determine what is in the best interest of the child and then to fight for it. Certain people can handle emotionally wrenching jobs longer, and frankly better, than others. Lasher believes she is one of those who can deal with the pressures. "It will be important for me to have my support systems in place, and I do," she said. Besides her close familial relationships, Lasher has two opposing passions that provide important stress relief: she is a certified pastry chef and a serious mountain climber. After graduating from Amherst College, and before coming to the Law School, Lasher headed to the California Culinary Academy, devoting a year to her lifelong passion for baking. Her Law School classmates were the fortunate recipients of dozens of cookies on stress-filled days. "It's a great stress reliever for me, and it's something I can do for myself and others." Less sedate but more demanding is her love of mountain climbing. Lasher has climbed some of the world's more formidable peaks: Mt. Kilamanjaro, the highest mountain in Africa; and Aconcagua, the highest mountain in the western and southern hemispheres. "My brother and I try to get a major climb in each year; I love the Zen of climbing." Given her love of adventure, it is not surprising that Lasher says, "I like new starts." That is a crucial trait for someone who meets one challenge-be it advocating for child protection or climbing Mt. Kilamanjaro-and then looks for the next mountain to climb. As Lasher says, "
because I can do it, I should do it."